✔️️ Tested and 'Tested' - Not only do we lab-test our locks an, but we give our locks a serious GO ourselves as well. Fun ensured! ✔️️ Serious Security - With 8 mm four-sided Steel Bars this lock means serious security! ✔️️ Durabililty - An durable weather-resistant Nylon Sleeve to prevent damage to the bicycle's paintwork, for durability of both your lock and bike! ✔️️ Money-Back Guarantee - SIGTUNA believes that we can only grow with 100% satisfied customers. Our customers experience that, we know you will too! SIGTUNA is our business, but most of all we are a team of bike lovers. For us "it is all about the ride". We want therefore nothing more than to protect your valuable ride. All it takes is an investment of 10-15% of your bike value in quality bike security. This 8mm Heavy Duty Bicycle Chain Lock is CELAB-certified (9027234318443) and gives your bike serious protection wherever you go. ► Click "Add to Cart" now to BUY your SIGTUNA BIKE Chain Lock - order NOW! CHOOSE THE RIGHT LOCK ✔️️ In Bike Locking it is important to choose the Right Lock. This SIGTUNA Bike Chain Lock is made of 9mm Square Chain Links made from 3T Manganese Steel. It is designed for Extensive Holding Power and is Lab-tested for High Tensile Strength and received a magnificent 7.5/10 Security Rating. PROTECT WHAT YOU VALUE ✔️️ At SIGTUNA we love cycling and you do probably do too! 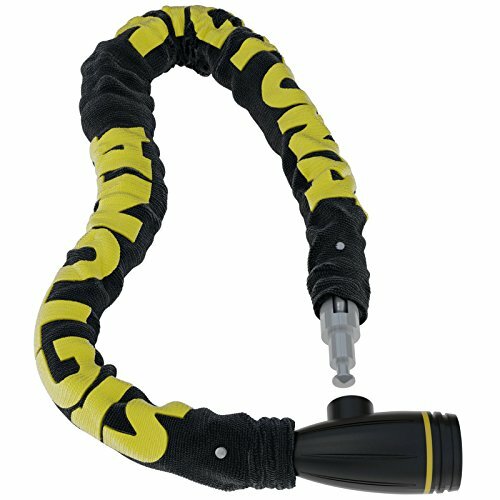 Protect what you value and buy this Multi-purpose Chain Lock to lock your bike, your Scooter, and Motor, or use it for Home Security at your Gate, Bike Rack, Door or Backyard. A great combo: Versatile and Secure! EASY TO USE AND CONVENIENT ✔️️ Locking this certified SIGTUNA Anti-Theft Bike Chain is like a walk in the park: open, wrap around and lock. The Bicycle Chain is protected with a Nylon Weather-Resistant Cover to protect your bike's paint and it comes with not 2, but in total 3 keys. No worries if you lose one! MONEY-BACK GUARANTEE ✔️️ If this Chain Lock is not the favorite you ever owned - for whatever reason - just return it and get a 100% refund. SIGTUNA Locks has a 3-Year Warranty and 60-day Money-Back Guarantee plus a dedicated 24-hour Customer Service. We stand for our products. Our customers love that, we know you will too! ORDER NOW ►► Want to have this Bike Chain Lock? Click "Add to Cart" NOW and get your SIGTUNA 8mm Heavy Duty Bike Chain Lock tomorrow and enjoy more awesome rides to friends and family knowing your bike is secure!